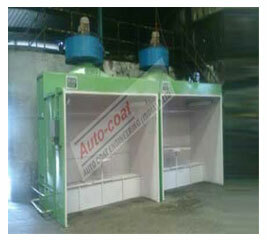 Autocoat Engineering is specialized in the manufacturing of all kinds of Spray Booth standard or customized, suitable for batch or conveyorised application for small or very large component.Many Satisfied customers in India are using Autocoat Spray Paint Booth because of superior designing & selection of bought out items (Design is most critical). 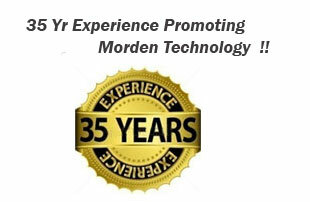 All Products are manufactured, Assembled & Tested for performance before dispatch and & commissioned at site. Training, after sale service & specialized Instruction Manual along with Laminations for SOP for Maintenance & TPM Activity are Autocoat expertise. Most of our customers are corporate companies with ISO certification and with their stringent quality requirements. Having 35 Year Experience & expertise Autocoat Spray Paint Booths are more precisely AutoCAD Engineered & Manufactured In-house & fulfils. It also takes care to Reduce dust problems, reduces over spray problems, and removes waste spray paint & solves Paint sludge disposal, helping for added value to the final product. Since it is the last operation prior to packing. Paintings in a clean paint booth normally have better finish & thus higher customer satisfaction value. IMPROVEMENT IN QUALITY OF PAINT FINISH. Safety is the basic reason. If fumes were not carried away then they would build up to create a safety hazard. 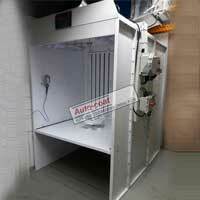 A Spray Booth performs the function of safety carrying these fumes out of the spraying area. Finish quality is a second reason. 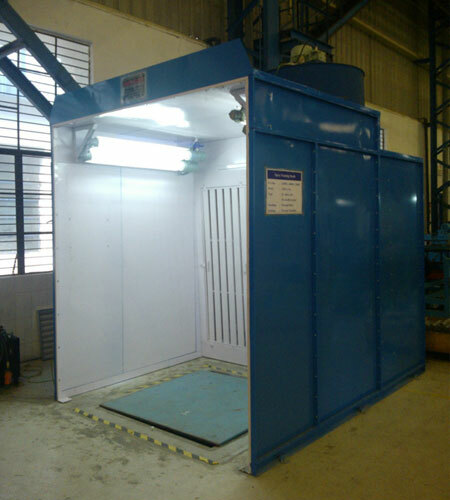 A Spray Booth helps in carrying away volatile fumes which also carries any paint overspray away from the products being painted. Overspray cannot settle on already wet painted products, eliminating a common cause for marred finish. Working environment is improved by using a Spray Paint booth. The atmosphere in the spraying area is kept clean and fume-free. In many cases the painter need not use a mask. His comfort and safety helps to increase productivity. Neighborly relations are improved by using a Spray Paint Booth. Filter and water wash Spray Paint Booth effectively removes paint particles from the air being exhausted outside the factory. In short, efficient, properly designed & installed Spray Paint Booth introduces a high degree of safety and lowers the risk of fire hazard. SPRAY BOOTH is engineered for maximum efficiency and economy. 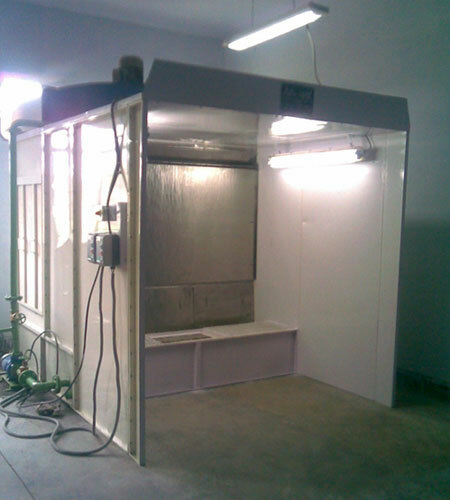 The Spray booth is designed to maintain an adequate velocity of clean air at the operator's breathing level and ensure that all the overspray paint is sucked into water tank. By keeping the operator's breathing level free from solvent and overspray paint, it is .possible to make the operators work continuously for longer periods, thereby increasing production and improving the quality of work. The SPRAY PAINT BOOTH eliminates messy pumps, filters, nozzles etc. and considerably reduces. Maintenance expenses, apart from increasing the water wash action ensuring a complete separation of pigment, resin and solvent with help of paint booth additive added, and allowing only the solvent to escape out along with the exhaust air. 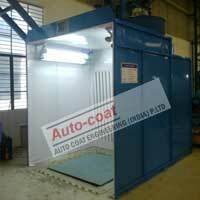 Autocoat Engineering is one of the most renowned companies when it comes to INDIAN SPRAY BOOTH Manufacturers in India & Spray Booth in India. 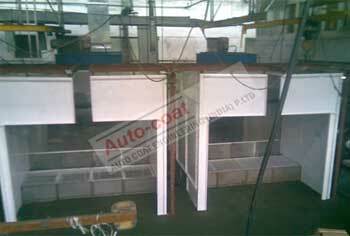 Autocoat Engineering is the most experienced Spray booth Manufacturer since last 35 years in India. 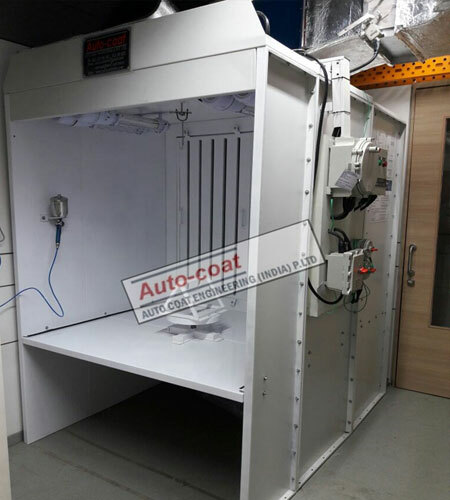 Autocoat Engineering have been manufacturing superior quality Spray booth among other valuable products .We have wide experience of manufacturing Spray booth with different material handling and different product size , and different production volume.